Through September 23. "A journey into IMAGIMATION: A Hundred Years of Animation Art From Around the World" celebrates the ongoing 100-plus year history of original rare animation production artwork since the creation of this magical art form. 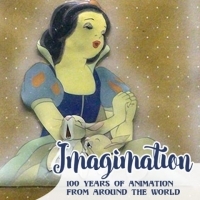 This extensive exhibition presents the full range of animation techniques, from the ground breaking traditional animation of Gertie the Dinosaur created by American, Winsor McCay, in 1914, through to today’s many digitally supported animation productions and applications. This exhibit features more than 130 works of art forming a timeline of the evolution of international animation. Open Mon-Sat 10AM-5PM, Sun 12-4PM. Adults $8 / Children, Seniors $6 / Members, military free.